MONGOLIA: Vestas has won its first turbine supply deal in the country with a 50MW order, while also announcing orders in China and Germany. The Danish firm will provide 25 V110 2MW turbines to the Tsetsii project in the Gobi desert, southern Mongolia. Clean Energy Asia, a joint venture between Japansese developer SB Energy and Mongolian infrastructure investor Newcomm, are developing Tsetsii. As well as delivery of the turbines, Vestas will oversee installation and is responsible for the balance of plant infrastructure. Vestas said it opened a Mongolian office earlier this year. According to Newcomm, which owns a 51% share in the JV, much of Mongolia's electricity comes from coal plants. The country's 1.13GW domestic power capacity is made up from 88% coal, 6% diesel, 6% renewables and 2% hydropower. Mongolia's parliament set out a energy plan for 2015-2030 with a target to increase renewable energy share to 20% by 2020 and 30% by 2030, Newcomm said. "It stipulates the promotion of investment in the energy industry in cooperation with international financial institutions and donor countries, utilising the abundant wind and solar resources in the Gobi region," according to Newcomm. The Tsetsii wind project is due online in 2017 and is being supported with funding from the European Bank for Reconstruction and Development (EBRD) and the Japan International Cooperation Agency. It will be Mongolia's second operational wind project, following the 50MW Salkhit site which was completed in 2013. 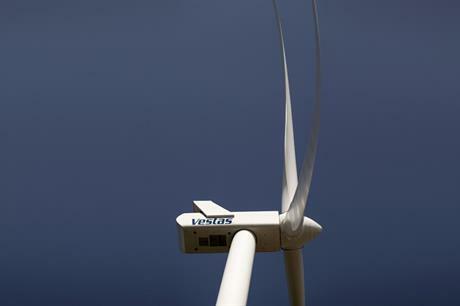 Vestas has also announced it will supply 25 V100 2MW turbines to CGN Wind Energy's 50MW Liulongtai project in the Liaoning province of northwest China. The project is also due online in 2017 and will be serviced by Vestas for two years. "The cooperation between Vestas and CGN is in its tenth year, and with this latest order, the accumulated orders in this partnership have exceeded the 1GW milestone", said Vestas Asia Pacific and China president Chris Beaufait. On Thursday, the Danish manufacturer announced it had won a 45MW order to repower a project in eastern Germany. European Energy's 26.3MW Prignitz project will have its 17 1.5MW NEG Micon/Vestas-legacy turbines and single Enercon E48 800kW machine replaced by 13 of Vestas' new V126 3.45MW turbines. The repowering, led by developer Green Wind Energy, will be completed in early 2017.